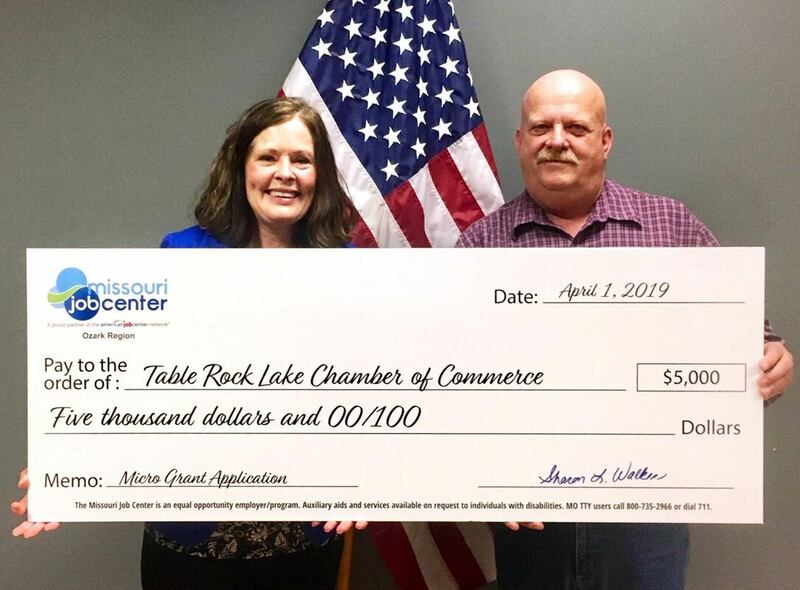 Sheila Thomas, President/CEO Table Rock Lake Chamber of Commerce, and Mark Maples, Stone County Presiding Commissioner, receive $5,000 micro-grant check from the Ozark Region Workforce Development Board. Table Rock Chamber of Commerce will host an economic development summit in June of this year. Funding for the event comes partially from an Ozarks Region Workforce Development Board micro-grant, in the amount of $5,000. “A few years ago, we formed the Table Rock Regional Partnership with the Stone County Commission, Table Rock Community Bank and the cities of Branson West and Kimberling City,” said Sheila Thomas, president/CEO of the Table Rock Lake Chamber of Commerce. This partnership, which Thomas said she would like to see grow to include other municipalities and businesses, was formed in order to look at processes of economic development that could be used in Stone County. “All of the members put in funds to join the Springfield Economic Partnership so we could get access to professional economic developers and see what is going on, get access to those leads, and see what some of the best practices in the field are, and see what other communities are doing. Economic development can be a full-time profession now,” she said. At this point, Thomas is not sure if hiring an economic developer is necessarily needed or would be the best course of action for Stone County. To that end, the Chamber applied for a micro grant from the Ozark Region Workforce Development Board. They were awarded a $5,000 grant on Wednesday, April 3. With those funds, the Chamber will be able to hire a professional facilitator for a Stone County Economic Development Summit. The event is scheduled for June 13 at New Testament Christian Church in Reeds Spring. The summit will be hosted by the Chamber along with Missouri Representative Brad Hudson (R-Cape Fair). It will feature presentations from the Springfield Regional Economic Partnership, the Missouri Department of Economic Development and others. The event will be open to the public. “We want to get as many people together as we can and kickstart the discussion,” Thomas said. “We are so fortunate to receive these funds from the Ozark Region Workforce Development Board. The Chamber formed the Table Rock Regional Partnership a few years ago to begin working on issues affecting economic development in Stone County, and this is a great step forward in addressing some of those issues,” she said. The economic summit this summer will primarily be aimed at gathering people together. “We are trying to convene people and get everyone on the same page so we can really start to look at how best to help economic development in Stone County,” Thomas said. “The summit will be open to anyone and everyone who is interested in economic development, but my priority is getting a representative from every municipality and every school district in Stone County to the event,” she said. The Ozark Region Workforce Development Board’s grant process was open to rural counties in the board’s seven-county region for capacity-building projects. The purpose of the micro-grants is to assist communities that need to up-skill their workforce to build capacity for economic development. The funds also help develop community leadership and workforce development. More information on the upcoming Stone County Economic Development Summit will be released as the event gets closer.